Videos, solutions, worksheets, and songs to help Grade 6 students learn how to subtract integers by "adding the opposite". 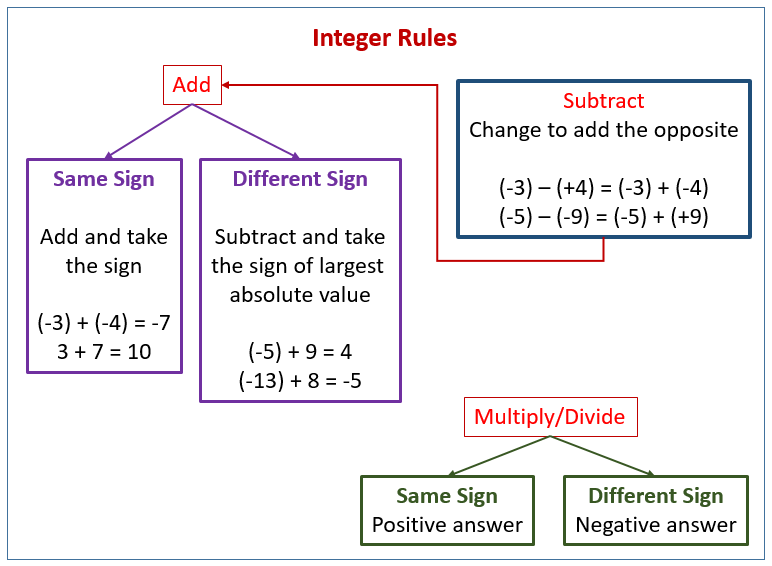 The following figures show how to subtract integers by adding the opposite. Scroll down the page for more examples and solutions. To find the opposite of an integer, we just change its sign. If it is negative, change to positive. If it is positive change to negative. To subtract an integer, we can rewrite it as adding the opposite. Then, we use the same rules as adding integers. 1. If the signs are the same, add the absolute value of the numbers and keep the sign. • subtract the smaller absolute value from the greater absolute value. • the sign will follow the number with the greater absolute value. Subtracting integers same as adding the opposite. To subtract integers, first rewrite the subtraction as adding the opposite and then complete the addition. This video goes through four examples on subtracting integers. To subtract integers remember to change it into an addition problem. The first number plus the opposite of the second number. How to subtract integers by adding the opposite? Number lines and integer counters are also used to model each example problem.